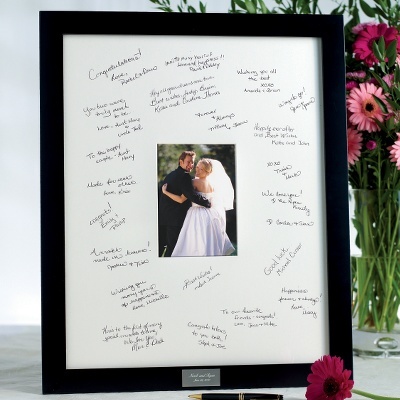 In addition to your wedding photos, your wedding guest book is something that will make you remember your wedding day forever. 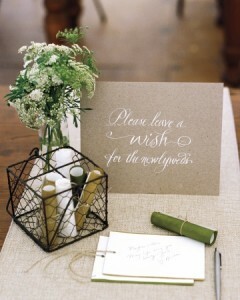 It is where your guests write their short messages or wishes for you and your spouse-to-be. 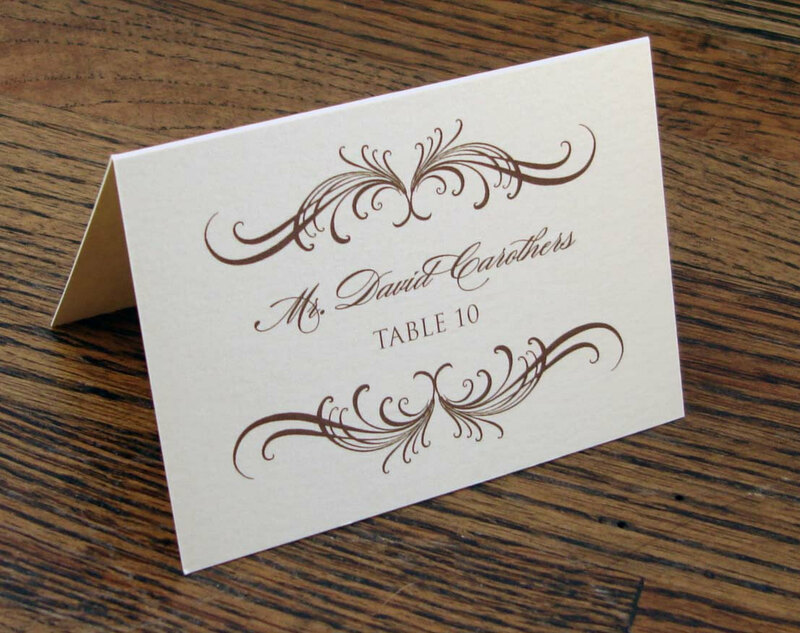 Traditional guest books are usually made with simple design, where guests simply sign their names and write short notes for the couples. If this sounds too mundane for you, there are lots of ways to make your wedding guest book extra special and unique. 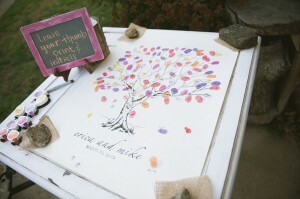 This guest book idea is a wonderful way to leave well wishes for the newly wed couples. All you need is some colorful vintage paper and ribbons to inspire your guest to write heartfelt messages for you. Photo booth guest books are currently the popular trend. 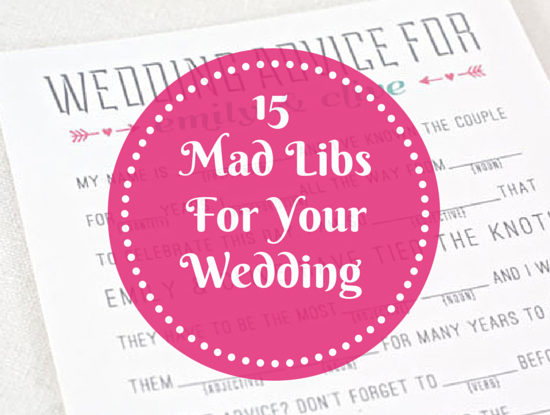 If you want a modern and fun way to remember your wedding day, then it’s something that you may want to consider. Rent a photo booth and let your guests take some fun images of themselves. Then, print those pictures, put them on your wedding guest book, and have them leave a message for you and your partner. 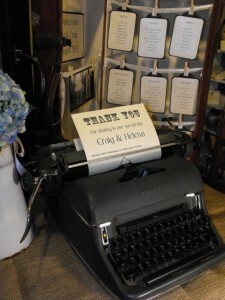 For vintage style weddings, the “typewriter” guest book is a perfect way for guests to say their good wishes for the couples. All that it takes is an old-fashioned typewriter and some long vintage paper. A guest book doesn’t necessarily have to be in the form of a book. 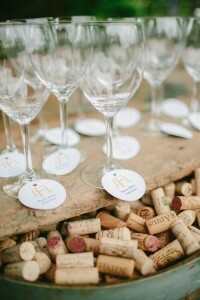 If you and your partner are wine lovers, then the wine cork idea is the best guest book option for you. Just arrange some wine cork pieces on one side of your wedding reception, and let your guests write their well wishes for you and your loved one. 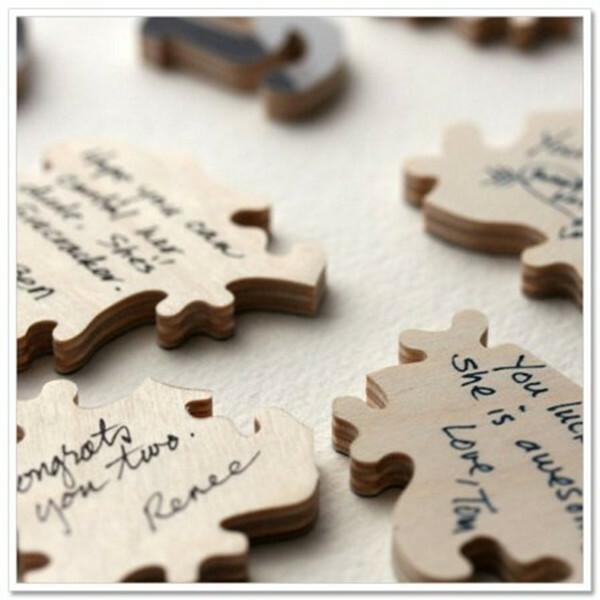 Their small size is just enough space to write sweet messages and encouragement for couples. 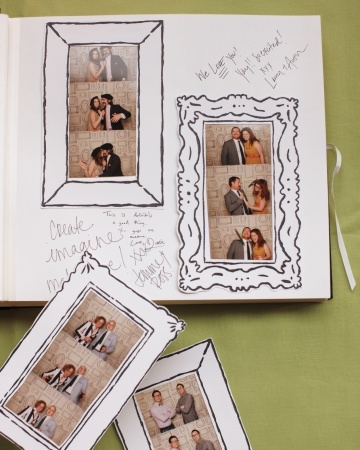 This guest book idea is perfect for couples looking for fun and unique way to relive their wedding day. Here, guests choose a leaf to sign their names and messages on. After the wedding, the newlywed couple can hang the artwork in their home as a reminder of all those special people who came to share the joy of the celebration. Guest book puzzles are a fun way to remember your wedding. Here, a photo chosen by you and your partner will be printed on one side of the jigsaw puzzle. The backside of the individual pieces will be signed by your guests with personal messages. After the wedding, you and your loved one can have fun putting all the individual pieces together. Another creative and unique guest book idea is the wishing stone guest book. 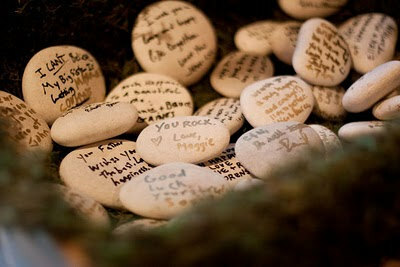 Just arrange a beautiful guest book table with plenty of pebbles and an attractive vase or box. When the party is over, your guests can pick up one stone, where they will write their sweet thoughts for you and your partner. After the guests signed their messages, they can put the stones inside the box or the vase. 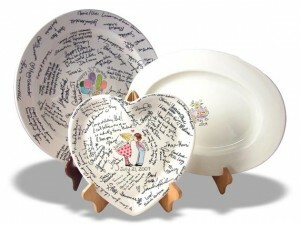 Guest book platter is another perfect visual reminder for those who attended your big day. Simply place some platters and a pen on a table, and let your guests write their wishes. After the wedding, you can display those beautiful plates in your home. 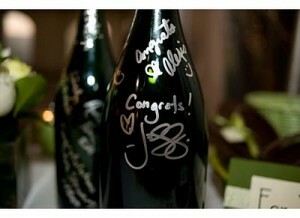 For wine lovers, wine bottle guest books are a perfect option for you. Just set up a beautiful guest book table with plenty of wine bottles and let your guests select a bottle they’d like to sign. After the wedding, you can display those wine bottles in your home as a reminder of those who attended your big day. Photo frame guest books are probably the most popular guest book idea. Here, you and your spouse-to-be choose your favorite photo and place it in the center of a large photo frame. 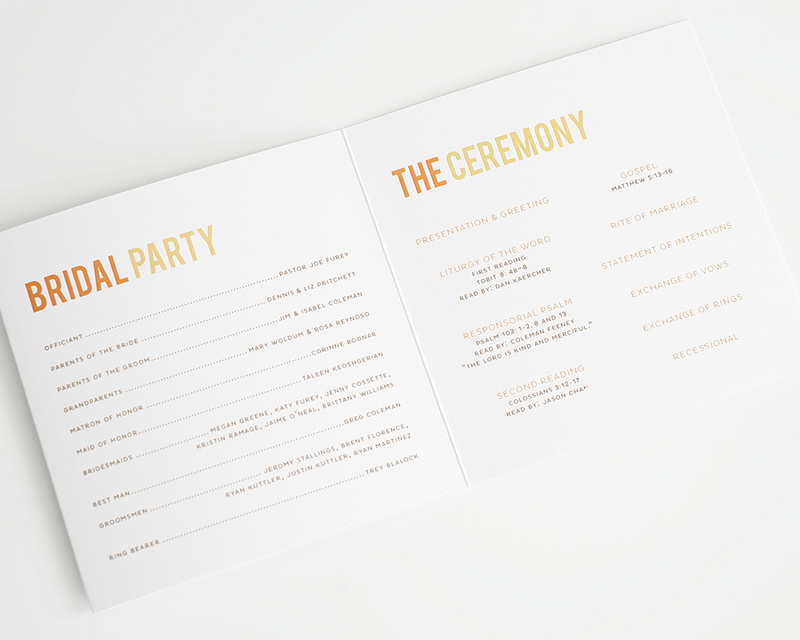 During the wedding, your guests sign on the white blank space and leave thoughtful messages for you and your partner. After the wedding, you can mount the photo frame on your wall. Wedding guest books are a wonderful way to recall the special moments you’ve shared with your guests at your wedding. Inspire your guest to express themselves with these beautiful and creative wedding guest book ideas, and make the memories of your wedding truly unforgettable.